Day two, and I have rapidly come to the conclusion that this a crazy city full of whack-jobs. After a visit to a Hindu temple I went for a wander around the business district. Dreadful, dreadful place, reminiscent of Canary Wharf, Dubai & central Chicago. Full of skyscrapers, and essentially a cathedral to obscene people making obscene amounts of money for sport. 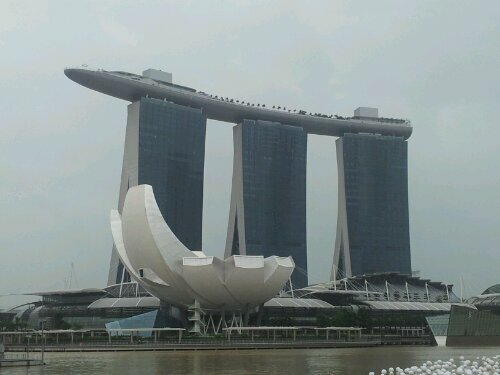 A little further north is the Marina, and the relatively new Marina Bay Sands hotel (below), which has an observation deck and swimming pool “perched” across the three towers. As it was howling a gale, and zero visibility due to fog, I decided not to bother going up. Oh, and guess what? Underneath the hotel is yet another shopping centre and casino. Who’da thunk it?! I wondered around the Marina, past the Singapore flyer, and basically did the entire F1 circuit on foot (well, I’m sad like that). Here’s the Merlion (or is it meh-lion?!) spouting water over the marina, with the business district behind. Later I passed through the Psychobabble of the world’s largest shopping centre, Vivo City, as you have to pass through it to get the monorail to Sentosa resort world. I’ll have to tell you about that later as I’ve a plane to catch, but suffice to say that from the start it’s sinister. On the monorail you’re fed propaganda about how this is “the most amazing place you will ever experience”, which led me to wonder what happens if you DON’T have fun there (I’m now having to leave the island in fear of being shot for insurrection). William Gibson was right: Disneyland with the death penalty. Bring on the airport, and Borneo. This entry was posted in Singapore and tagged another bloody shopping centre, F1, Formula 1 circuit, Marina Bay, Marina Bay Sands, Melion, Raffles, Raffles Hotel, Sentosa, Singapore, Singapore Sling, Vivo City by littlegingerkid. Bookmark the permalink.